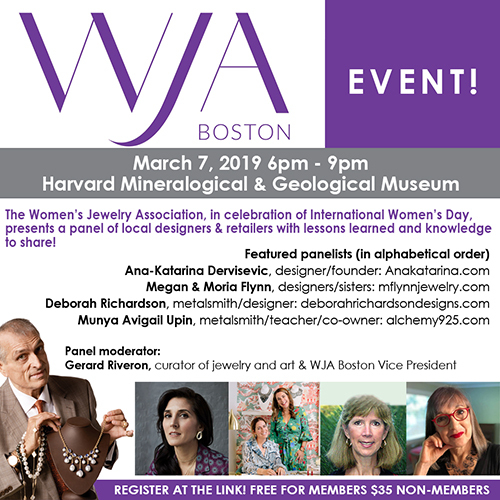 WJA Boston, in celebration of International Women’s Day, presents a panel of local designers & retailers with lessons learned and knowledge to share! March 7, 2019 6pm - 9pm at Harvard Mineralogical & Geological Museum! Don't miss this fantastic panel featuring designers AnaKaterina Dervisevic, Megan & Moria Flynn, and Deborah Richardson, and metalsmith, teacher & retailer Munya Avigail Upin! The panel will be moderated by WJA Boston's Gerard Riveron, curator of art and jewelry!